Autumn is certainly in full force now and while we still have beautiful days, apparently El Nino has pushed the weather patterns closer to late October at this point. But three weeks ago it was still quite nice (through increasingly variable) and I decided to ride to Olympia to spend a long weekend with a friend. It’s about 65 miles by car from my place to Olympia but of course you can’t ride that direct route. 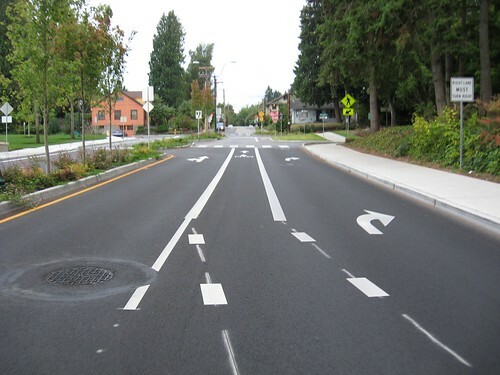 There are pretty much three routes of varying degrees of directness from Seattle to Olympia, all of which are neatly collated (in reverse) on this site: Three ways to bike to Seattle. The route people most often take is the STP Route, which is quite flat, but pretty goes around Olympia. 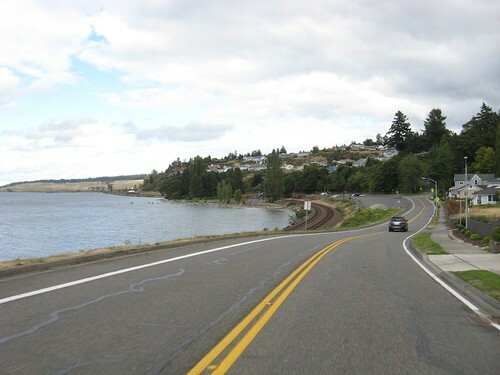 Cutting across to Olympia from it’s nearest intersection point (approximately Yelm, so I rode this section on the last part of the last day from this years tour) would lead to about 95 miles riding. Pretty out of the way. I’ve also ridden at various times an equally indirect route that veers west instead of east. The first days ride from Olympia to Potlatch State Park of this years tour covers the bulk of it, leaving this route before the Park taking the very scenic highway 106 along Hood Canel, then working your way to Bremerton and the Ferries to Seattle (which I’ve ridden several times the first being last day of my 2007 tour). 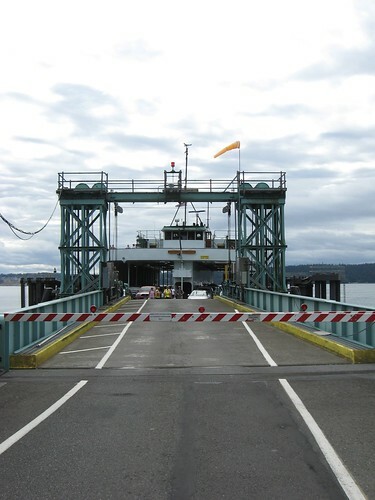 The third option, which is actually the shortest option and most direct, involves taking a ferry to Vashon Island, and then working your way along the coast down to Olympia. 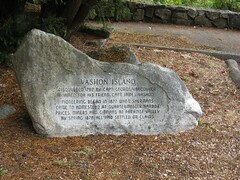 As I haven’t ridden Vashon Island before (its been on the “to ride” list for years) and I liked the way the two ferry rides broke up the trip, this was the way to go. I found a route from Alex Wetmore which was quite similar to the Oly to Sea route from the above site and with a few tweaks to I was good to go. It’d been threatening to rain all week and I worked up some bus routes as an emergency alternative, but I pretty much was committed to the ride. I was heading down on Thursday September 22nd and that day dawned overcast with a good chance of morning rain, but then much less chance for the rest of the day. That seemed good enough, so I packed my bicycle for the trip (used my two small Arkel Panniers mounted on the rear rack) and set off. 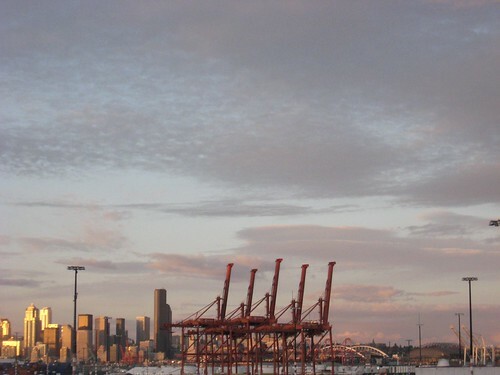 The route was almost entirely new for me including a trip through the center of downtown Seattle to the waterfront. 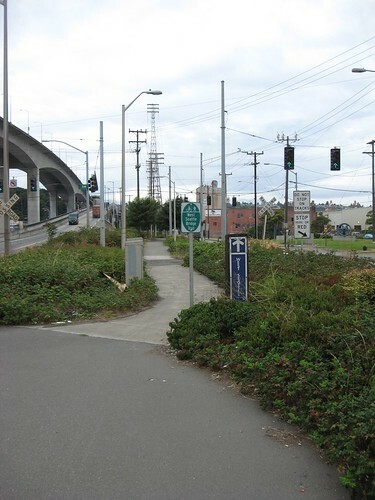 I’d riding on the waterfront before but the West Seattle Bridge Trail was again new. The ride through the city wasn’t bad through you have to have constant attention all around you. The rest of this first part of the ride was pretty straightforward. 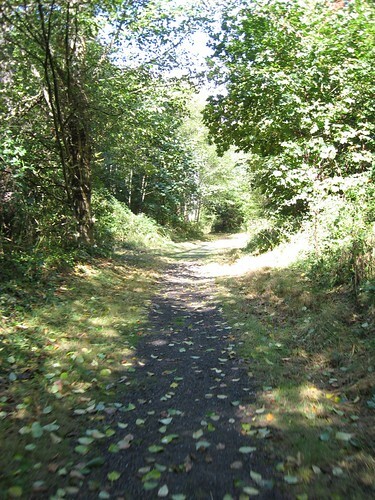 The West Seattle Bridge Trail, follows a bridge over the Duwamish below the high automobile bridge and then splits into several other trails in West Seattle. I was pretty much taking the straight road route to the Ferry Terminal but this was mostly clearly marked and with bicycle lanes or sharrows. I made the ferry minutes before it left, got a ticket and rolled on as they were casting off. Can’t beat that. 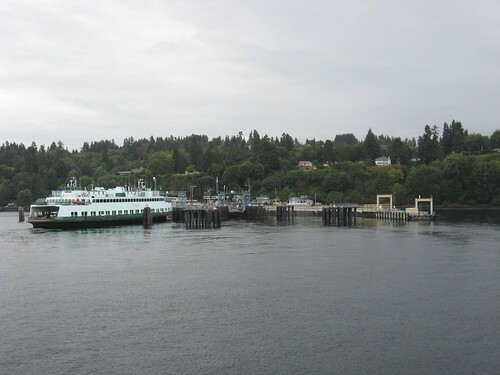 There was some rain showers and a pretty stiff wind on the ferry crossing but it wasn’t coming down as I docked on Vashon, though there was a thick mist. That was to shortly change. As is so often the case the route began with a climb up from the ferry terminals. The islands in the Puget Sound are rocky, hilly and forested and those hills notwithstanding my favorite places to ride. I was riding a direct route across the island but it was still mostly in the woods with sections along the coast. Nice pavement with shoulder most of the way and the traffic I met on this Thursday morning was all deferential. It began to drizzle then rain and I stopped to put on all the rain gear. The route was always up and down but as is typically the case in these islands, most hills were short. There were two climbs greater than a mile in length though – the initial climb up from the ferry and then a last ascent before a good long descent to the ferry on the south end of the island. At the top of this later climb there is a small park dedicated to Vashon’s “discovery” where I stopped briefly to take off the rain gear as the rain had stopped and I was hot from the climb. It’d be a fairly cool summer overall, but there was some late warmth in the early parts of September. This led to a lot of the fruit blooming late which meant the wild blackberries that grow like a weed all over the state were full of berries right now. The bushes in this park had been pretty picked over, but it was still easy to find a couple of handfuls of ripe, sweet blackberries. Setting off I jammed down the hill and a few rollers until I arrived at the Tahlequah Ferry Terminal. Back on the mainland at Point Defiance Park, which is west of the large city of Tacoma. 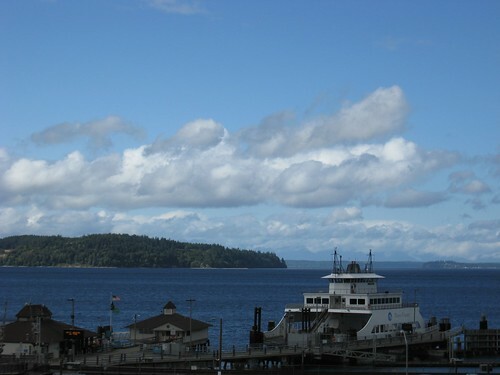 The route skirts Tacoma and mostly follows the coast on this tail end of the Puget Sound. I begin by winding through the park to avoid the very narrow and steep road up from the ferry. I basically intersect that road as it flattens out and exits the park in the small Tacoma suburb of Ruston. The route I had then wended its way through suburban streets avoiding heavily trafficked roads as it worked it’s way toward the Tacoma Narrows bridge. This was effective but rather annoying – I was constantly looking at the cue sheet and you’d rarely stay on a street for more then a couple of blocks. This was the only part of the ride where I missed a turn and it was solely through not looking at the cue sheet at the right time. There are much more direct routes one can take if one is comfortable with riding in moderate traffic which I did on the return trip. Eventually the route comes near the Tacoma Narrows Bridge and crosses Hwy 16 via a pedestrian Overpass. From here the route became really fantastic. It turned toward the coast and at last returned to sticking to a single road for miles at a time. 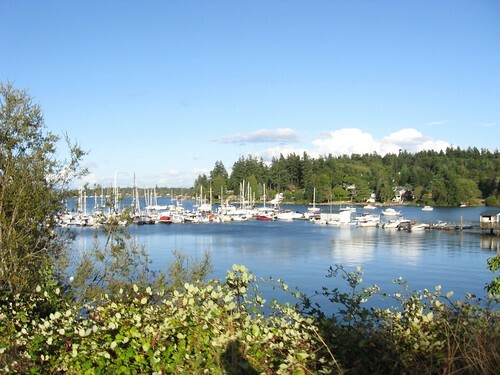 A good section was in the Chambers Creek Properties which are self-described thusly: “This 930-acre site includes over two miles of saltwater shoreline, two-and-a-half miles of urban creek and canyon, and breathtaking mountain and Puget Sound views.”. It seems to be sort of a watershed, wetlands and water treatment site that is setup as a park around much of its 930 acres. The section along the coast is particularly nice riding, but its also great riding when it turns a bit inland and you dive down to sea level through a wooded canyon. 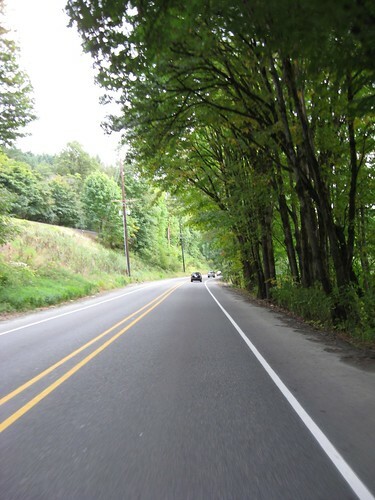 From here the route hugs the coast on winding roads as it makes it way to the small town of Stellacoom. I paused briefly in Stellacoom at a little park to eat a granola bar and refill my water bottles (ditching some absolutely vile water I’d gotten on the ferry) before setting out inland. One of the big impediments to a direct route to Oly is Fort Lewis (now Joint Base Lews-McChord) which occupies a lot of land east and west of I-5 (which is pretty much the direct route). So all bicycle routes have to ride around it in some way. The road from Stellacoom to Dupont rides through the base for the most part – the western part of the base is mostly empty land and a golf course. This was decent enough riding in the woods for the most part, but it had pretty constant traffic. 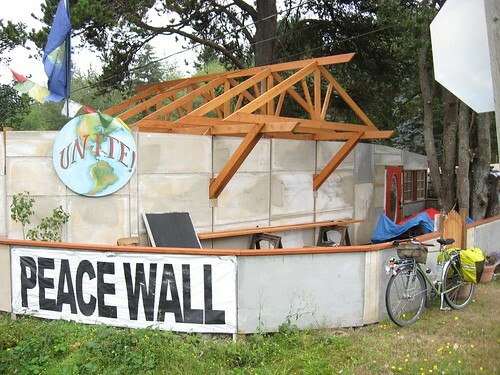 Eventually you turn off into newly constructed Levitt-town style “neighborhoods” for the Intel company town of Dupont. These sort of places are always weird in my mind, completely soulless and the worst sort of strip mall style development. From Dupont the route puts you on I-5 for about 1000 feet – you get on at the Dupont Ramp and then exit at the Old Nisqually Ramp almost immediately. An interesting experience, but riding on a real highway isn’t much of a good time. The very wide shoulder was littered with shredded tires and other debris and the traffic, 70mph at this stretch, roars by continuously. 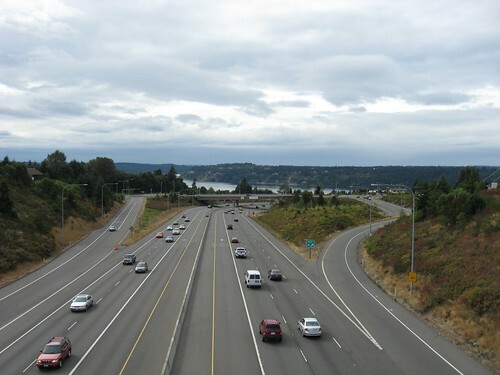 From this small section of I-5 this improve dramatically. The ride down into the Nisqually Valley, whose western end is all a nature reserve/watershed was beautiful. Riding through woods with some big trees, the Nisqually River (packed with fisherman) and mostly downhill. The route is heading southeast at this point, away from Olympia a bit. However this turns out to be a smart move as it takes you around the Nisqually Valley walls and there was no more climbs of any significance. The route works it way through the woods and then turns onto Hwy 510 which turns into Pacific Avenue, which runs right into Olympia. Pacific Avenue was wide shouldered and/or with a Bicycle lane the entire way which was nice as the traffic was heavy now. 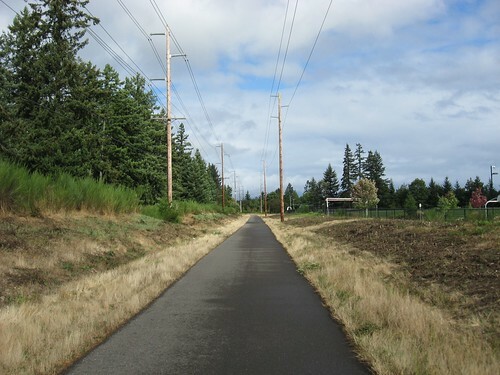 In Lacey I was able to turn onto the Woodland trail which I wrote about in my Riding Around Olympia post from a few months ago. From the end of the trail it was just a few blocks through the Capitol neighborhood of Oly to my friends house and I was done. I arrived in Olympia at 6:15pm having ridden 64.5 miles. I stayed in Olympia until Sunday September 25th which was a crazy blustery day. It’d go from sun through broken clouds, to pouring rain, to grey overcast but always with a strong, gusting wind. I decided to take the bus back. But the more I thought about it the less I really wanted to deal with the bicycle and the bus and my bags and so on. So I thought I’d take the bus from Olympia to Tacoma, which is pretty empty on a Sunday morning, then ride to Point Defiance Park and reverse the ride from Vashon on. I put on all my rain gear and set off to the downtown Olympia Bus Station. When I got outside I determined that the strong wind was actually in my direction (I’d had a headwind most of the time on the ride here) and with not having to fight wind and rain I could just do the whole ride back. So I did. I’d printed out the reverse directions at my friends in case I decided to ride or partially ride back and I had a sandwich in my Hobo Bag so I set off. At first it was windy and a bit misty with the occasional big gust of wind. But after I rode through the Woodland trail and was on the streets of Lacey (back on Pacific – I was pretty much just reversing the route) it began to just bucket down rain. I pulled off at a park just outside of Lacey and waited it out, eating my sandwich. Eventually it slacked and I set off again. It sprinkled, then drizzled then misted and then finally the clouds began to break up. By the time I was in the Nisqually Valley there was bits of blue sky and the occasional bit of sun. Now I’m not going to go over the return route turn by turn as like I said I reversed my route to Seattle. But I did a couple of things differently which I figured I’d mention, plus a bit about the return ride in general. I ended up not once looking at the queue sheet on this return ride. I have (I think) quite a good sense of direction and I often only need to ride (or drive) a route once to be able to repeat it, even reversed. This combined with years of experience of riding in a wandering, exploratory style has allowed me to be able to make certain assumptions that pan out often. Being willing to fail and backtrack if necessary helps with this a lot. A rigid, follow the route exactly style, is just not my way. So on this ride back I was using my memory my sense of direction but also was following some Dan Henry’s that were on my route. Following random Dan Henry’s is one of my favorite ways to do unplanned rides and I’d noted on my way to Olympia that there were yellow Dan Henry’s almost the entire route. The ones I was following today were green but basically I took the risk that they’d more or less going where I was going. Plus I knew I could head in the right direction if they seemed to head too far off route. By following these I bypassed the short little segment on the I-5 that I took on the way down. The Dan Henry’s pointed straight where they would have turned onto the Highway and crossed it instead. The route turned downhill and at one point I passed a housing development whose loop of road was almost to the road I was on. It had a fence you could walk a bicycle through and I thought as I passed that that should take you more or less to Dupont. So I quickly turned around and walked through the fence noting a lot of other bicycle tracks. On the other side the Dan Henry’s continued. So the risk paid off. I almost immediately abandoned the DH’s again as I found a little trail (pictured above) that began paved and became nicely packed dirt. I rode a mix of suburban roads and trails through this housing development and eventually was back on the Dan Henry’s which had taken a much steeper route to where I was now. From here it was another very straight flat trail and I was back onto the cutoff road from the road that runs past Fort Lewis. I go into this in detail to try to explain how I tend to ride – a combination of knowing which direction I’m going, following a route whether marked or on a cue sheet and straight up curiosity that leads me to explore. 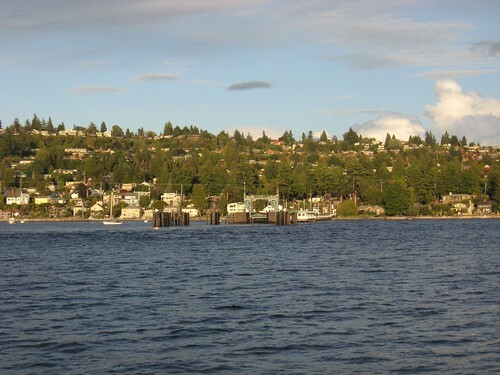 I now reversed the route pretty directly and was able to just follow my memory: Stellacoom, the coastline, Chamber Creek Properties and the suburbs near the Narrows Bridge. The green Dan Henry’s were still often visible and I was on their route. I followed them into the winding suburbs near the Narrows bridge and it was much less winding even if on more trafficked roads (though all of these had bicycle lanes and were totally fine). They led me wrong only at the end where they actually crossed the Tacoma Narrows Bridge and did an unknown amount of riding there. I only went about three blocks out of my way through before I abandoned them and followed my memory and sense of direction to Point Defiance park. I did not follow at all the twisty, suburban route that I had on my way down, but took a direct road to the park. This was a much busier road and would have been uphill the entire way from the ferry so not really recommended for the south bound trip. But on a Sunday afternoon it was definitely the way to go. The weather was beautiful now, mostly clear with scattered clouds. What a turnaround from the downpours of the morning. There was still a pretty stiff wind, but it was with me again. I had to wait about a half an hour for the ferry, but a decent break at this juncture was welcome. Anyway from here on to the end it was just a repeat of my previous ride. 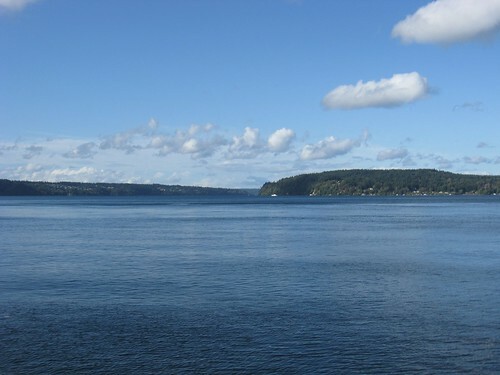 But it was much more pleasant riding across Vashon on the late afternoon in the sun then it had been in the drizzle and clouds on the ride down. As I knew I was chasing daylight at this point I kept up as good a pace as I could across the rolling hills of the island. A couple of miles from the Ferry Terminal the obvious signs of Ferry traffic were to be had and I poured it on. I made it to the ferry just before they started loading cars. It was 6:30pm as I arrived in West Seattle and I knew I had at least an hour of riding to do. The sun was going down and it was magic hour – everything lit with an amazing light. As I crossed the West Seattle Bridge the scattered clouds were amazing shades of pinks and purples. These colors deepened as I rode onto the Seattle Waterfront and by the time I hit the tourist areas it was deep twilight. I decided to ride around instead of through the city which added a few miles but was safer. So I rode along the Waterfront to the Elliot Bay Trail which took me through Interbay and then onto streets to Fremont and finally on a few miles of the Burke Gillman trail to the University District and home. I arrived home at 8pm having ridden 69.3 miles.